Hooray! Deeper In 4 Grandparents & Parents, Too! Is Available! I recently wrote a book of Scripture prayers for grandparents and parents to pray for the children they love. But, it is more than just a book of prayers. Look what a few people who took a look at it have to say . . . 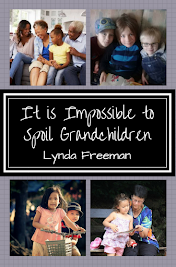 I recently wrote a book about passing on a heritage of faith to our grandchildren/children - It Is Impossible to Spoil Grandchildren; and Other Important Facts for Grandparents and Parents, Too!and I'm about to release my second book; Deeper in 4 Grandparents & Parents, Too! Praying the Scriptures for the Children You Love - Old Testament Edition. 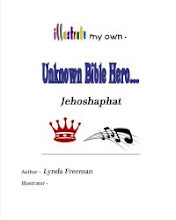 I am looking for parents and grandparents who would be willing to take a look at the book and write a brief endorsement for me to include in the book. The thing is, I have to have your endorsement back to me by Saturday afternoon - the 29th. Yes, in just two days. I heard a fun quote at the Legacy Coalition meeting I was at last week . . . Do you know what kind of book sells for the most at a garage sale? The answer is an autographed book! With this in mind, if you live in the West Michigan area, I'm very happy to invite you to a Local Author Book Signing event with seven or eight authors; I am one who has been invited to participate! Mark your calendars for Thursday, September 24, 2015 from 7pm to 9pm and join me at the Kregel Bookstore in Grandville, MI. If you live in the West Michigan area, please mark your calendars for Thursday, September 24, 2015 from 7pm to 9pm and plan to stop by the Kregel Bookstores in Grandville! Why, you ask??? Because they are hosting a Local Author Invasion and I've been invited to participate! I'd love to meet you, so, please stop by! Stay tuned for more info . . .
Sweet Grandchild Story - Snuggles, Songs & Sleeping! I'm very happy today to share with you another, "sweet grandchild story" . . . this one is from my brother-in-law! 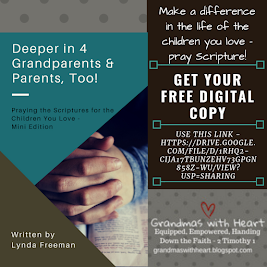 I'm working on a new book which will engage grandparents and parents in praying the Scriptures for themselves and for the children they love. Deeper in 4 Grandparents & Parents, too! Old Testament Edition will be available soon! In it you will find 52 weeks of Scripture passages and prayers which walk you through the Old Testament and guide you in praying. Each week provides a Scripture passage, a personalized Scripture prayer and then breaks the prayer into seven parts so each day for a week you are able to focus on and pray specifically through the passage for your life and for the children you love. I thought I'd share a passage and prayer with you today . . . so you can see a little of what Deeper in 4 Grandparents & Parents, too! Old Testament Edition will be like! Sweet Grandchild Story - Me & My Alien Friend! I'm very happy today to share with you another, "sweet grandchild story" one of my readers on grandma's cookie jar shared about her sweet grandson . . .
"My grandson is currently into grocery shopping at the store we have set up in my dining room; and blowing bubbles. I am sure if he had an alien friend he would love to show his alien friend how to shop, and how to blow bubbles. "Thank you Debbie for sharing! What might your grandchild/child do if they had an alien friend? Please share your "sweet grandchild/child stories" with us! I Have Three Winners on grandma's cookie jar! 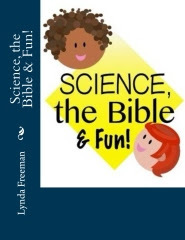 I'm happy to say Tina & Heather W both won a complete first year of Science, the Bible & Fun (you'll find the review at this link) and Leela King won an e-book of It Is Impossible to Spoil Grandchildren (you'll find the review at this link). Thank you Tina, Heather W and Leela for reading grandma's cookie jar (please email me at lyndagcj@gmail.com by August 5, 2015, so I can get them to you).